What are you unconscious of? And why would you want to know? So much of you—your wounding, relationship dynamics, and patterns—gets played out on the canvas of your life. You may wish some aspects of yourself were different or wrestle with inner conflicts, but just can’t figure out or change them with your mind or will. You may feel that something—you just don’t know what—is in the way of what you want from your life. You may have a sense, a knowing, that you’re so much more. Maybe you even glimpse great capacities within yourself but don’t know how to connect with or realize them. If you sense this, you’re right. There is more to you than what you’re aware of. 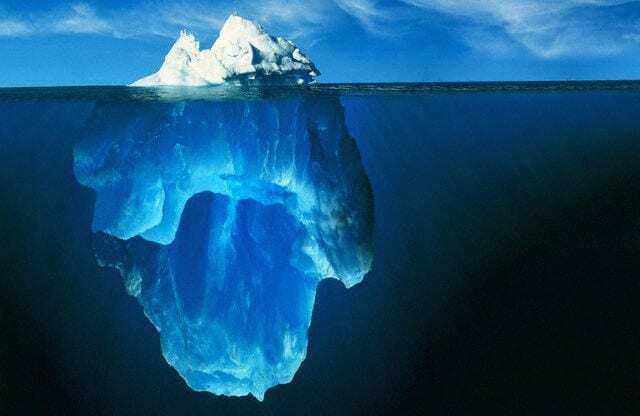 If you were an iceberg, your unconscious would be 90 percent of it—the submerged part. That’s a lot. Which means, you’re conscious of 10 percent. Which is very little. It’s hard to imagine, given all that we know about ourselves, we only know such a small fraction of who we are. It’s humbling. Psychotherapy calls it the unconscious; hypnotherapy calls it the subconscious. Terminology aside, it’s the part of you of which your conscious mind is unaware. So what’s in your unconscious? Also called your shadow, your unconscious is an ecosystem of emotions, instincts, and desires which are too painful and too overwhelming to feel. So they’re disowned, denied, and repressed. They’re often negative, like hate, anger and rage, despair, existential angst, revenge, grief, and lovely murderous fantasies. Your unconscious (or shadow) also holds your inner, unrealized potentials. You have a vast storehouse of incredible capacities, gifts, and resources which you can tap into. You have inevitable wounding growing up as a child. Inevitable misattunements from your parents or caregivers. Events and situations that were too painful. Childhood memories. Trauma. Infant and pre-natal experiences which got locked in your psyche and body when you were wordless. These are ways in which you learned to cover over, not feel, not know because it was too dangerous, too threatening, too much. Too ______ (you fill in the blank). Defenses are brilliant ways of being you developed as a child to stay safe, survive, get and keep the love available to you. But these ways aren’t necessarily true as an adult and in the world beyond your family. If you went into your head to avoid difficult emotions, you probably intellectualize. If you had trauma, you may dissociate. Or you may use humor as a way to defend against what you really feel. These are ways you connect to and relate with people, usually formed in response to your parenting environment. For instance, if your mother, even though she loved you, didn’t physically hold you enough or emotionally attune to you in the way you needed as an infant or child, you might have anxiety and feelings of abandonment in your relationships. Beliefs are the railroad tracks of your experience. They’re the shape you form as a child in response to your caretakers and environment. Filters of your experience, beliefs are the grooves in your brain which lock you into perceiving yourself, others, and the world in a certain way. If you’re prepared to travel that far back, your subconscious also records your past lives. It’s a repository of your experiences beyond our time and space dimension. This is the good part. This is all that you can be but don’t know yet. Haven’t stepped into yet. Who you would be if you don’t have your current limiting beliefs? For instance, if you believe you’re unlovable, it would be really hard to receive love and care even when they’re available. On the other hand, when you know you’re loved you receive affection with ease and receptivity. Also, your unconscious is a treasure chest of your unclaimed talents, power, gifts, creativity, capacities, inner guides and resources, psychic and spiritual abilities. And your Higher Self. Your unconscious has access to potentials even beyond what we currently know as a human race. There’s latent magic lying in wait for you there.